Yesterday Summer and I packed our bags and headed for the airport. 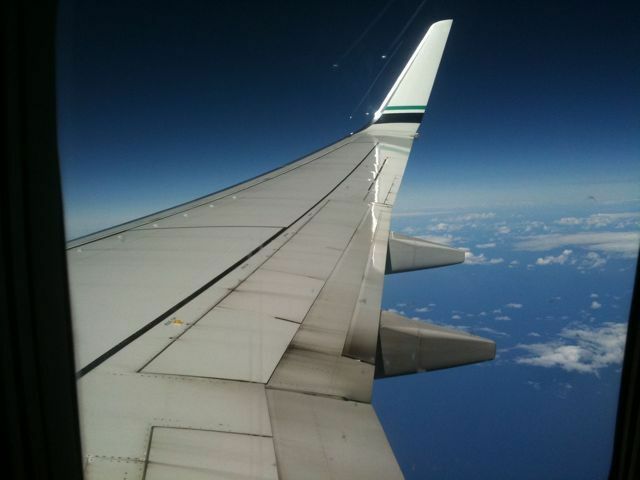 Our plan was to catch a flight to Seattle and then another to Lihue Hawaii. Well, we made the connection, but the flight was full. After we were sure we wouldn’t be making the flight we checked the departures board and attemped a flight to Honolulu and then one to Las Vegas. Having no luck on those flights either it was getting pretty late and the list of destinations was dwindling so we decided to return to Portland and try again on Friday. Friday morning came early and we headed back to the airport, resuming our attempt at Hawaii. With no small amount of luck we got the last two seats on a flight to Maui. Neither of us have been to Maui before (this is my first trip to Hawai’i) and as of the time of this writing, I’m somewhere over the pacific sitting next to a cute couple with a seemingly endless supply of little Captain Morgan bottles that they have been kind enough to share. Summer and I have nowhere arranged to stay when we arrive. For me, that’s the fun part. We’ll touch down in another couple hours and figure the rest out then.